Ocean City north of 15th Street was mostly undeveloped from there to the Delaware line in the late 1940s. There was, however, a small community known to locals as “Maryland Fenwick” in the area of today’s 141st Street (known at that time as Lea Avenue). There were approximately 50 cottages and a general store, which centered around the old Methodist campground that had begun in the late 1890s. The area suffered extensive damage in the March Storm of 1962 with several of the small houses washed away and totally destroyed. 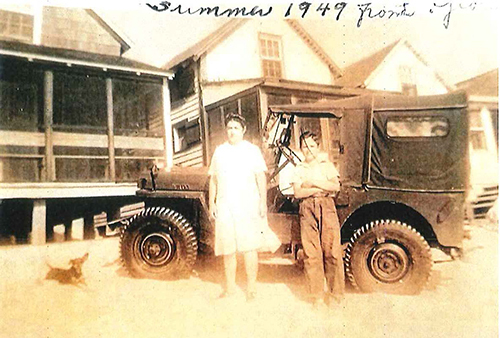 In this photo from 1949 a young Blaine Bunting poses with his mother Delia in front of their cottage in Maryland Fenwick. The roads were unpaved at that time hence the World War II surplus Jeep. Photo courtesy Blaine Bunting Sr.